Here at MNS, we often find ourselves fielding questions from curious families as well as the general public. Though we may have slightly different responses (depending on who is asking--parents, college students, teachers, reporters, local businesses, etc. ), many similar themes emerge. Below are some of the things we’re asked about most often--enjoy! Mixed-Age Groupings: Primary classes are composed of a 3-year age span, including children ages 3-6 years. This allows for peer teaching, broad social interactions, individual differences in learning style and pace, and creates a social community of family. It provides the youngest students with a graded series of role models and the older students with peer teaching opportunities for reinforcement of learning. Individualized Instruction: Each child learns and develops at her/his own pace through the use of materials and lessons introduced by trained staff. The integrated curriculum is introduced sequentially and at the developmental level of each individual child, allowing every child to work to capacity and at their ability level. Child-Directed Program: Within the structure of the classroom and curriculum, children are encouraged to pursue their interests, make responsible choices for themselves and direct themselves to constructive activities. Since children's interests vary, this opportunity results in an independent, self-motivated learner. Designed Environment/Materials: The school environment is prepared with a variety of specially designed Montessori materials - multi-sensory, sequential and self-correcting. Educational materials are carefully selected to meet the needs of range of students in each class and to meet the goals of the program. Specialized Staff: In addition to background and experience in early childhood education, teachers receive specialized training in the Montessori method. Training programs throughout the world prepare and certify teachers in the field. The course of study includes educational philosophy, academic training in the curricula areas, early childhood development, classroom management, and use of materials for individual lessons. Hands-on Learning: The use of materials for learning in the Montessori classroom is an integral part of the program. Based on a belief that children learn by doing, lessons for math, language and all subject areas include hands-on materials for use by the student. Integrated Curriculum: The Montessori curriculum integrates many subject areas into the lesson at hand. This enables students to use their knowledge and skills in context and to see the "whole" picture. Are Montessori schools all work and no play? How do children concentrate for 2-3 hours without interruption? Montessori schools intentionally provide large blocks of unscheduled time to ensure that individual children have the time to settle into a task that interests them and are not unnecessarily interrupted when they are engaged in a worthwhile activity. Generally, the majority of each morning and afternoon is devoted to self-motivated work. This time may include individual- or self-chosen small group activities and short lessons by the teacher for children who have accepted an invitation to the lesson. During the work period, teachers observe the behaviors of the children and invite individuals and small groups to short lessons when they see opportunities to assist a child’s progress. Before and/or after the work period, you may find whole-class lessons or other activities occurring (such as adult-led group circle meetings for which participation of all children is required). Outdoor play time, specials, and enrichment classes for the whole group are also scheduled outside of the work period. This video features a four-year-old Montessori students as he progresses through a 3-hour uninterrupted morning work cycle. And if you have a little more time to spare (20 minutes), sit back and enjoy this video of a Montessori classroom in action as children transition from one part of the day to the next. Dr. Montessori observed that children are more motivated to learn when working on something of their own choosing. A Montessori student may choose his focus of learning on any given day, but his decision is limited by the materials and activities—in each area of the curriculum—that his teacher has prepared and presented to him. Beginning at the elementary level, students typically set learning goals and create personal work plans under their teacher’s guidance. Montessori schools teach the same basic skills as traditional schools, and offer a rigorous academic program. Most of the subject areas are familiar—such as math, science, history, geography, and language—but they are presented through an integrated approach that brings separate strands of the curriculum together. While studying a map of Africa, for example, students may explore the art, history, and inventions of several African nations. This may lead them to examine ancient Egypt, including hieroglyphs and their place in the history of writing. The study of the pyramids, of course, is a natural bridge to geometry. This approach to curriculum shows the interrelatedness of all things. It also allows students to become thoroughly immersed in a topic—and to give their curiosity full rein. Do Montessori students have the same teacher for all subjects rather than work with “specialists” in different curricular areas? Montessori teachers are educated as “generalists,” qualified to teach all sections of the curriculum. 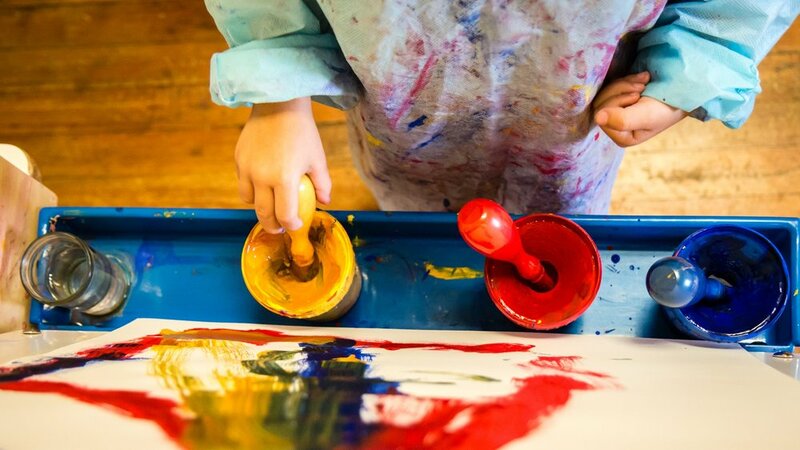 Many schools choose to also employ specialists in certain enrichment subjects, including art, music, foreign language, physical education, and science. Some Montessori schools strive for very small classes, Others value the lessons of community when the size of the class is somewhat larger. Montessori classes for children in preschool or kindergarten might include a small classroom of 10-15 students or a large classroom of 20–30 students. Nevertheless, all of these classrooms will contain students whose ages span 3 years. No matter the number of children enrolled, all members of the community benefit from this multi-age set-up. Older students are proud to act as role models; younger ones feel supported and gain confidence about the challenges ahead. Private Montessori schools are independently owned and operated, and each sets its own business practices, including the cost of tuition. Typically, tuition fees vary from region to region and from school to school. Some private schools offer scholarships for families in need of assistance, and many offer reduced tuition when parents enroll more than one child. There are also more than 400 public Montessori schools in the United States. These include charter schools, some of which enroll students through a random lottery process. Like other public schools, charter schools are tuition-free. Are there Montessori schools for older children as well? Dr. Montessori first developed her educational approach while working with a preschool population. She gradually extended her approach to children and youth of all ages. The benefits of Montessori—the emphasis on independent learning, for example, and the warm, supportive community—continue to be important at each stage of development as children grow into lifelong learners and responsible citizens of the world. Today, some Montessori schools provide all levels of learning, from infant & toddler though the secondary (high school) level. Others offer only certain levels. Check out this video to see Montessori in action across all grade levels. Public Montessori schools are mandated to administer the same standardized tests as other public schools. Some private Montessori schools also administer standardized exams, particularly if they will be required by schools into which their students may transition. Other schools choose not to administer these tests. Grades, like other external rewards, have little lasting effect on a child’s efforts or achievements. The Montessori approach nurtures the motivation that comes from within, kindling the child’s natural desire to learn. A self-motivated learner also learns to be self-sufficient, without needing reinforcement from outside. In the classroom, of course, the teacher is always available to provide students with guidance and support. Although most Montessori teachers don’t assign grades, they closely observe each student’s progress and readiness to advance to new lessons. Most schools hold family conferences a few times a year so parents may see their child’s work and hear the teacher’s assessment—and perhaps even their child’s self-assessment. Children with special needs, such as learning differences or physical disabilities, often thrive in a Montessori setting. Montessori teaching materials engage all the senses, important for students with distinct learning styles. Students learn by doing and are free to move about, an advantage for those who require a high level of physical activity. And each child has the latitude to learn at his own pace, without pressure to meet formal standards by a predetermined time. Nonetheless, some students may need greater accessibility or more support services than a given school can provide. In each situation, the individual's needs and the school’s resources should be carefully assessed to ensure a successful match. advantage of the Montessori approach—including multi-age classrooms with students of varying abilities and interests—is that it allows each child to work at her own pace. Students whose strengths and interests propel them to higher levels of learning can find intellectual challenge without being separated from their peers. The same is true for students who may need extra guidance and support: each can progress through the curriculum at his own comfortable pace, without feeling pressure to "catch up." There is a small but growing body of well-designed research comparing Montessori students to those in traditional schools. These suggest that in academic subjects, Montessori students perform as well as or better than their non-Montessori peers. In one study, for example, children who had attended Montessori schools at the preschool and elementary levels earned higher scores in high school on standardized math and science tests. Another study found that the essays of 12-year-old Montessori students were more creative and used more complex sentence structures than those produced by the non-Montessori group. The research also shows Montessori students to have greater social and behavioral skills. They demonstrate a greater sense of fairness and justice, for example, and are more likely to choose positive responses for dealing with social dilemmas. For more information, see the Overview of Research on Montessori Education in the online Research Library of the American Montessori Society. How do students fare after being in a Montessori program and transitioning on to another program? Many children spend only their preschool years in a Montessori classroom. Others complete the elementary grades before transferring to another—usually traditional—school. A smaller—but growing—group of students stay with Montessori through secondary school. A child who transfers out of a Montessori school is likely to notice some differences. For example, instead of choosing his own work to investigate and master, he might have to learn what’s on the teacher’s lesson plan. Instead of moving freely around the classroom, there’s a chance she’ll sit in an assigned seat. Instead of learning in a classroom with a mixed-aged grouping, it’s probable that she’ll be placed just with students her own age. Fortunately, children are adaptable. Poised, self-reliant, and used to working harmoniously as part of a classroom community, students who transition from Montessori typically adjust quickly to the ways of their new school. Did you know that Google's founders Larry Page and Sergei Brin credit their early Montessori education? Many other successful grads also cite their years at Montessori when reflecting on important influences in their life.